A common rule of sports, business, and just about everything else in life is that things that are not broken need not be fixed. 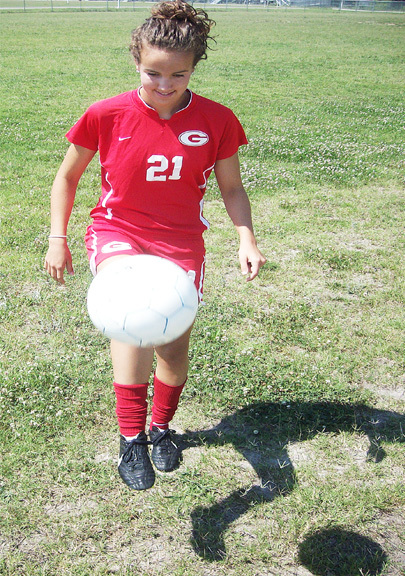 In their inaugural season three years ago, Grassfield's girls soccer team took fifth in the Southeastern District. In her rookie year of high school ball (though she's almost an old-timer overall, having been a local soccer force since grade school), Samantha Phillips blasted 10 shots past local keepers. Two seasons past, the Grassfield gals moved up in the district, stepping to third place - mainly on the strength of 14 goals from Phillips. Phillips and her squad had spent two seasons moving up in the district; last spring, they decided that the region was next. After all, why ruin a good habit now? "We thought it would be great to start a new tradition," Phillips says. "It was awesome how far we've come over the past few years, and great to be a part of it." They stormed out of the gates this year, charging past Tabb. But then a brick wall popped up, in the form of losses to Beach powers Cox and Ocean Lakes and perennial Southeastern champ Hickory. "The games we lost were to some very strong schools," Phillips says. "It made us stronger. Knowing that we could stay that close to some top schools made us believe we could win our district." It worked; after a close win over Princess Anne, Grassfield would go 13 games without a loss. "You design a preseason schedule that challenges you," said coach Kevin Ellis, who coached Phillips in youth soccer before she got to Grassfield. "We weren't worried about (the losses). From that point on, it was confidence booster after confidence booster." By the time their streak was about over, Grassfield was near the first girls soccer district crown in school history. A 1-1 tie with Oscar Smith on May 13, coupled with second-place's Western Branch's loss to Indian River the same day, gave them the title. However, there was still a moral victory left to snare. In their season finale at Hickory on May 18, the Grizzly girls had one last shot to take. The Lady Hawks took a quick 1-0 lead, and Grassfield tried to regroup. "At halftime," Phillips recalls, "we talked about showing them that we deserve to win this game." On the strength of a pair of Nicole Wagner scores (Phillips assisted on one), they took home a 2-1 victory, not only snaring their first-ever win over Hickory, but knocking the Lady Hawks out of the district playoffs for the first time of the millennium. Grassfield kept rolling in the district tournament, roaring past Indian River and Great Bridge (Phillips got a goal in the 2-0 Bridge victory). "We felt really confident," Phillips says. "We set our goals to win the district and make it to regional, and we did. I knew we would, with all the heart from all the girls. Everybody wanted it, and we had the talent to do it." Unfortunately, things ended the next week for Grassfield in the first round of Eastern Region competition at Old Dominion University. Ocean Lakes jumped ahead early, and Phillips tied things up with her 14th goal of the season, but the Lady Dolphins escaped with an overtime goal. About three seconds later, Phillips (already the leading career scorer in school history was 38 goals) was already looking forward to her farewell tour next season. "I want a tournament and regular season title," said Phillips, one of three Lady Grizzlies to make the All-Region team. "I want to make it farther than we did last year." "I just want her to continue to be a real hard worker on the field," Ellis said. "On and off the field, she's always shown leadership. Everybody sees her work hard, and know they need to work hard too." The proud owner of a 3.8 grade point average, Phillips already has her future planned out beyond her graduation in June 2011. "I went to Longwood and I loved it," she said of a previous visit (she can't actually commit until a few months into her senior year). "I thought I could make a difference there." She'd like to become a physical therapist. Still, there's one more spring to unleash upon south Hampton Roads opponents next season - next year, Phillips will be on her farewell tour. Another district title next season, she says, "will make winning everything 10 times better. It makes me want it even more!" For the Eastern Region, that could be the worst of news.